Night Classes Begin on AUGUST 17th! Day Classes Begin on AUGUST 17th! Need textbooks or supplies for class? Want to show your school spirit? What about a good book to read in your spare time? Or are classes giving you a headache? The Jones Bookstore can help you out. Textbooks and supplies for all of the Jones classes can be found here. By working with the instructors, the Bookstore staff knows just what you need to start classes. Show your school loyalty. There is a wide variety of "Bobcat" clothing in stock. You can be in fashion and support the Maroon and Gold at the same time. Need a gift with a touch of "Bobcat" to it? 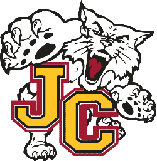 We have pennants, cups, and other JCJC gifts -- perfect for birthdays, Christmas, and ... well, any occasion. Energy sagging? That term paper is more headache than complete? The Bookstore has an assortment of snacks and over-the-counter medicines. All of this, without leaving campus. Stop in and look us over. You may be surprised! During our "rush" period (first days of classes) the store hours are usually extended. These hours will be posted.